On most Thanksgivings, my uncle Jim falls asleep sitting at the table with an unlit, gravy-soaked cigarette in his mouth. This is not our finest family tradition, but it's tradition all the same. And even if your uncles all typically manage to remain conscious whilst giving thanks, it's fair to assume you stay true to any number of equally peculiar turkey day rituals of your own. It's normal to be somewhat ashamed of your family's holiday idiosyncrasies. That said, it's always refreshing to take a look at the rest of our great nation, where absurdity in the realm of Thanksgiving customs runs rampant. Know that whatever strange rain dance you perform with your Grandpa Hugh while the turkey cooks is not the strangest ceremony out there. Here are some of the absolute weirdest Thanksgiving traditions maintained all across America. In 1947, the Truman Administration established an utterly useless tradition known as the National Thanksgiving Turkey Presentation -- and it lives on. Each year at Thanksgiving, the leader of the free world is required to drag some helpless turkey into a public space and offer the poor creature a presidential pardon. It's basically a formal declaration to the turkey that says, "we will not be eating your for dinner this year, my friend." George H.W. Bush made the whole turkey pardon shtick a national tradition in 1988. Frozen turkey bowling is exactly what it sounds like: In place of balls and pins, folks roll frozen turkeys towards rows of bottled soft drinks. Invented in 1988, the pseudo-sport is best played down the aisle of the frozen section at a local grocery store. It can, of course, take place elsewhere, as super market employees do not tend to enjoy this. If you thought you were supposed to flip turkeys like pizza dough, you've been led astray. But all the same, every year, there are people who congregate to test how far and high they can sling frozen turkeys. If you're thinking that sounds like a waste of a turkey, you are correct. These sorts of contests are particularly popular in Indianapolis, Indiana where locals like to light their poultry on fire before competing. High risk, super low reward. The team over at the Santa Barbara Zoo likes to get the animals in on the whole giving thanks thing with a tradition they call the "Thanksgiving Day Smash," where they invite locals to hit the zoo on Thanksgiving Day, and simply watch animals "interact" with pumpkins. We're not sure why this is fun, but apparently it is. The ritual maintains, year after year. It comes as no surprise that families are eager to do some jogging after inhaling the biggest meal of the year. You'll find 3-mile "turkey trots" all across the country -- but beyond the actual event, it's become something of a major tradition for participants to dress in turkey costumes while they run. It's certainly worth noting that there are hundreds of thousands of American people with full turkey suits lying around for the occasion. 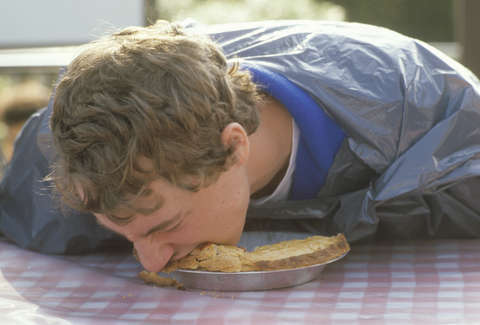 We're not really sure why mass-eating contests exist at all, but apparently, people love to shove things like hot dogs and pie-slices down their throats at alarming rates to earn some form of clout that doesn't really sound like clout. Either way, around Thanksgiving, local communities all over the country gather for pumpkin pie eating contests where participants gobble pies without the use of their hands. This feels like a great way to contract a taste aversion to pumpkin pie until next year's eating contest. See? Uncle Jim isn't so bad, after all.